With the keyboard re-assembled I needed to figure out if all of the keys were working. To test this I plugged the keyboard back into the base unit and main motherboard and fired it up. Lucky for me, all was working again. So to test all the keys I wrote short program to show the keys and their codes to ensure I had it all working. Success. Now that I had a functioning keyboard I needed to start thinking about what computer I would connect that 30 year old keyboard up to. At first I considered using my son’s old Dell gaming PC that he no longer used since he upgraded. My needs were low for computing power, graphics or sound so nearly any somewhat modern computer would do. My limitation was the size of the interior of my TRS-80 shell, which while large couldn’t accept certain ready built PCs as well as a 12″ flat screen that fit within the small dimensions of this 80s era computer. This is where I stumbled into some very good luck. I had mentioned my project to my colleagues Mike from work and as my luck would have it, he offered me a free old Lenovo laptop that he didn’t need that was in very good shape, though I didn’t plan to use the keyboard or case at all. Its screen was a perfect match for what I was looking for two so it killed two birds with one stone! So onto the next step, which is to connect my TRS-80 Model 4 keyboard to the computer. This was one of the more fun parts of the project. Doing some research I found the perfect solution which was the Pi3 Matrix Board with X-Keys software. While I have the ability and components to build my own hardware/software integration, I was not excited about the debugging sessions to get it all working great. P.I. Engineerings technology and software is great and worked like a champ. Upon receiving the board it was a matter of only a few minutes before I had the board wired up with the tons of jumper wires in my electronics supplies. 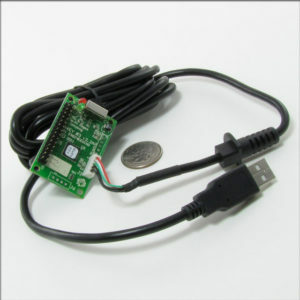 The keyboard has a cable that connects to the main CPU, simply disconnecting that at the motherboard provides the connector that you wire up with jumper wires to the pins on the X-Keys unit. 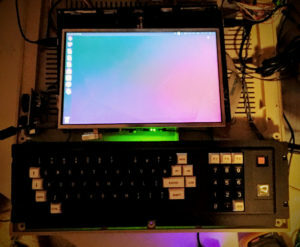 Using the software included with the X-Keys unit you can program the board to work dynamically when plugged into different devices or hard wired for a single device as I did with my TRS-80 Model 4. 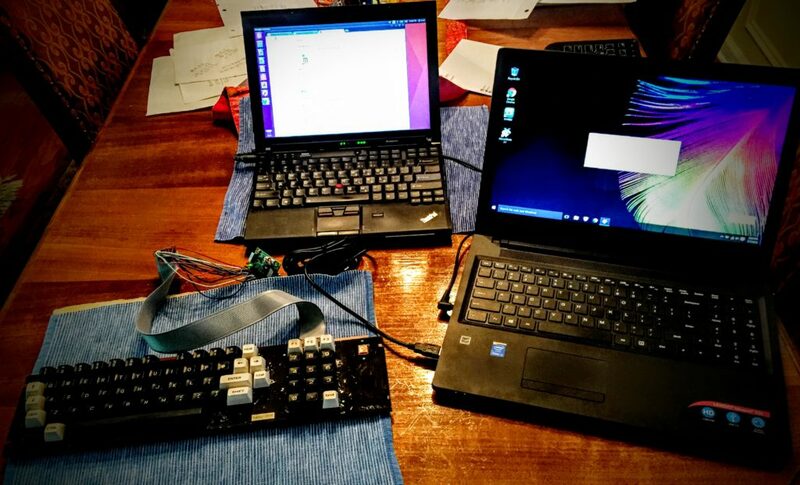 By pushing my key definitions down to the board meant that the communication was fast and very simple, no software needed on the host device, it just looked to this Lenovo laptop was talking to a modern keyboard instead of the ancient device it actually was. Programming the Pi3 X-Keys Matrix Board to work with the TRS-80 Model 4 keyboard and Lenovo Laptop. 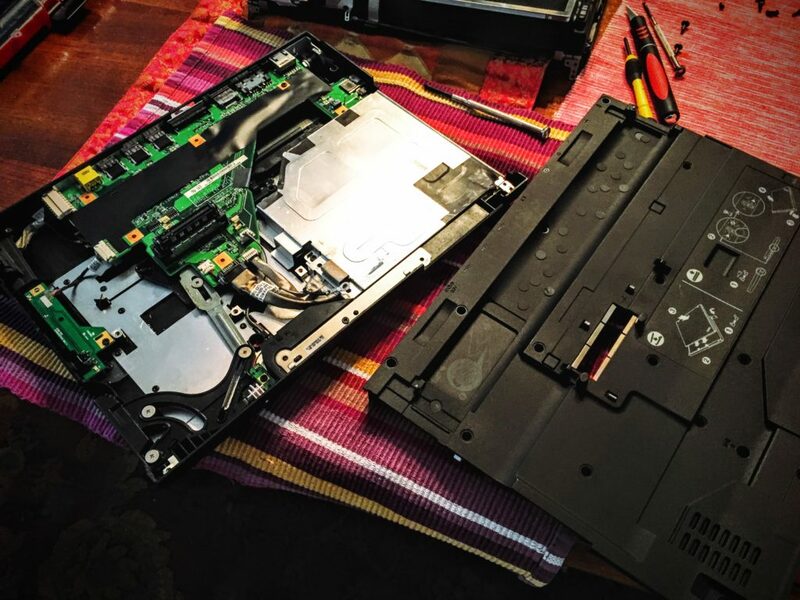 Now that things are looking good for the keyboard contacts and the communication with the laptop that would be powering the computer, it was time to do a bit more serious brain surgery level work. I now needed to prepare the laptop to be within the case and more importantly the screen mounted within the bezel. I decided I would head off to bed with the victory in hand of connecting the keyboard and save the next challenge for another day. Days later I worked up the courage to try to disassemble the perfectly working Lenovo Laptop into a bunch of loosely connected parts for the opportunity to wedge it into this 30 year old behemoth. Lets get started! First step was easy and what I like to think of as a “Confidence Builder”. Popping off the fascia of the screen was as easy as getting the top off a Pringles can… though not nearly as tasty. Next was a bit more scary, separating the bracing metal from the screen and plastic case. Trying not to mess up the wires that powered the camera (which I have no use for) and more importantly the WIFI wires the are mounted in the screen area. 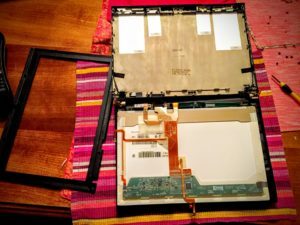 The hard part was left for last… disconnecting the LCD from the board then threading the connector through the slot below the gap between the plastic screen back and the main board. Undoing the tape protecting the LCD connector to the motherboard was a little disconcerting, but once it was off and reconnected I felt that it was not as risky as I first believed. Now with the LCD cable threaded through and reconnected to the the LCD I was able to fire up the laptop again but this time with the screen on the outside such that I can mount it within the portal of the TRS-80 Model 4 without any problem. At this point I have a working laptop connected to my totally rebuilt keyboard… awesome! 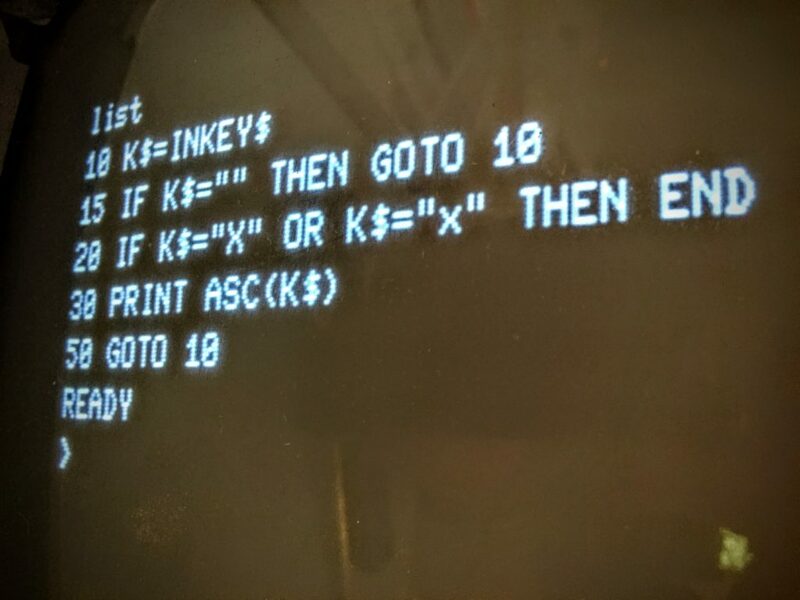 Now, the next step was to determine how I would make it possible to turn on the computer from the outside of the TRS-80. My ideal solution would be to wire up the existing orange reset button on the keyboard as the On/Off button for the laptop. 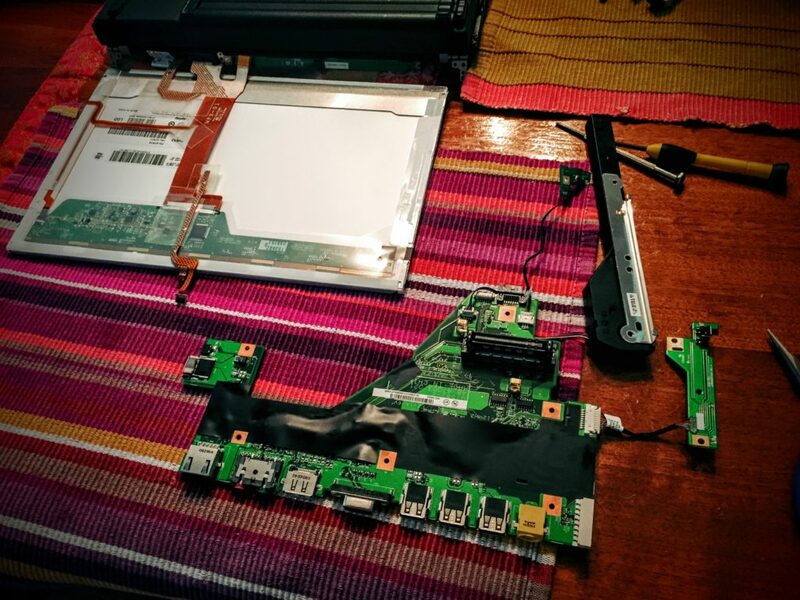 To do this I would need a way to wire up the existing laptop on/off button… but this sounded risky and potentially fatal to the laptop if I messed it up. 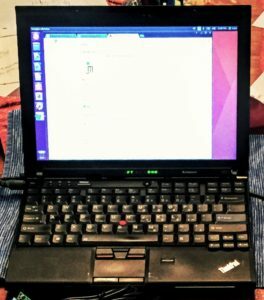 After a little thinking I decided that the best approach would be to try to secure an old docking station for the Lenovo that I could take apart and wire up with little worry of destroying the main computer. The docking station approach would allow me to wire up the TRS-80 on/off button to the docking station on/off button. Another 30 minutes later I had bid on (and ultimately won) a docking station for about $12 bucks… yay me! When the docking station arrived I quickly unscrewed the plastic outer casing and started to plan what I needed to do. I decided I needed to break this docking station down to the smallest parts so I could easily fit it together in my TRS-80. Other than the final step of soldering positive and negative connectors of the on/off button of the docking station to a couple of jumper wires coming off the orange reset button of the TRS-80 keyboard, the disassembly of the docking station was easy. plugging in the laptop to the docking station provides a nice solution to a potentially complicated issue. 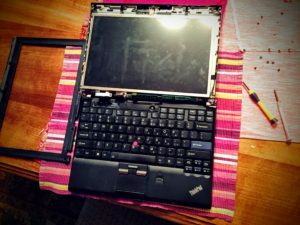 Next step is to prepare the case to support the 12″ wide screen laptop (versus the 12″ square CRT screen). This would require a new idea to make this fit snug and look natural. After a bit of reading I settled on the idea of trying Bondo to shape the bezel to fit the new sized LCD screen. Great job! Must give you a lot of fun. 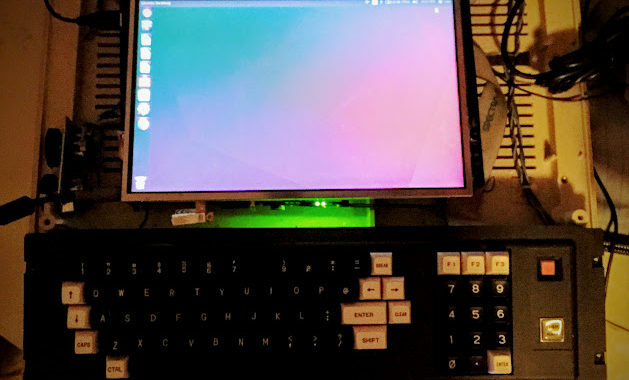 How about running a Trs-80 emulator on it? Thanx Hans! Yes, I do have a MAME (http://mamedev.org/) TRS-80 Emulator for it… great fun to have the best of both worlds on this computer… plus I have the other Model 4 (still under repair) setup with original equipment.